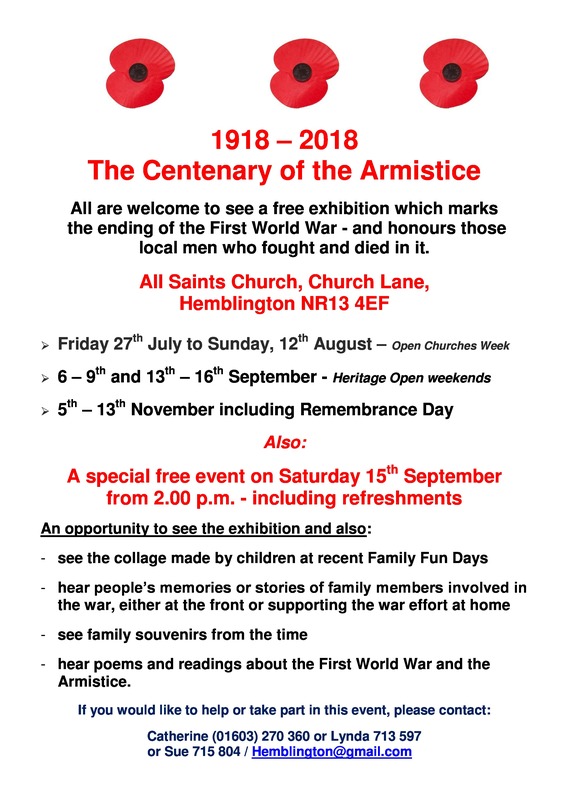 The parish team and The Friends of All Saints Church will be commemorating the ending of the First World War at Hemblington church, with an exhibition over several weeks in August, September and November. We are aware that many organisations nationally are planning to hold exhibitions and in order to make this an event to commemorate local people who fought and died in the conflict, we will be exhibiting information about the people listed on the memorial in the church, as well as a display about the Battle of The Somme, which claimed the lives of many Norfolk men. Earlier in the summer local children will have made a collage illustrating their understanding of war – and peace – which will form a part of the exhibition. We should therefore like to invite local groups to join us on the afternoon of Saturday, 15th September, both as guests for afternoon tea and also to participate if they so wish. we should love to hear from them. Personal reminiscences are so important and throw a light on how people coped during and after the war, though we do understand that they are likely to be three or even four generations removed now. The Hemblington team have lots of events planned and it all sounds great. If you can’t help or visit Hemblington but you have your own events you’d like to share please do just drop us a line at norfolkinworldwar1@gmail.com. 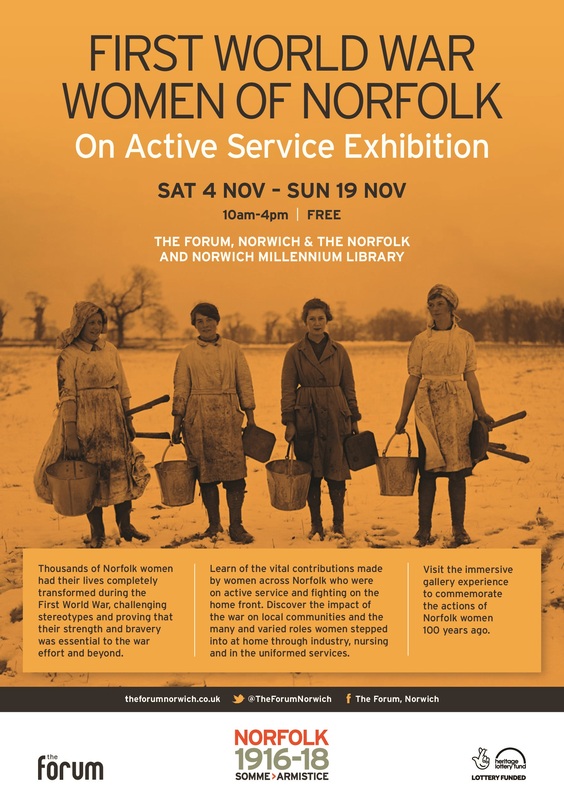 Join The Forum in Norwich, and the Norfolk and Norwich Millennium Library for a day of World War One themed events this Armistice Day. Following on from The Forum’s Battle of Gaza exhibition in April, there are more chances to view the pop-up exhibition panels as they start their tour of the county – find out more about the exhibition and where to see it below. The Battle of Gaza touring exhibition marks the centenary of the Second Battle of Gaza on 19 April 1917, in which hundreds of men serving in the Norfolk Regiment fought. It tells the story of how the Territorial Force soldiers were recruited and of their journey from Gallipoli to Gaza. It also demonstrates how the campaign in the Middle East impacted on the Norfolk Regiment. 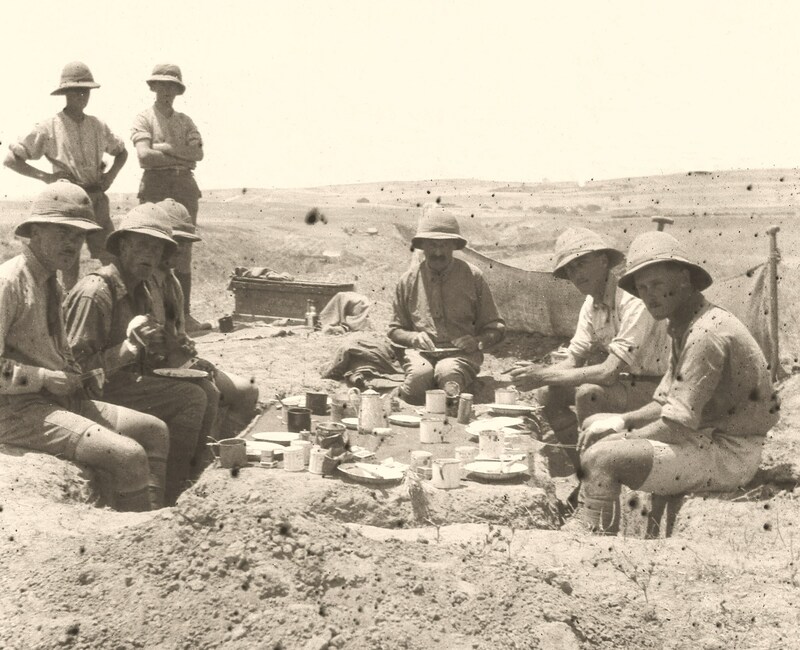 Officers Mess, 1/5th Battalion, The Norfolk Regiment (Territorial Force) Palestine, 1917. Image courtesy of the Purdy Archive. While we’ve covered lots of different campaigns & aspects of WW1 here on the blog there are a few we’ve not yet looked at in much detail, two of these being the War in the Air and our transatlantic allies. 2017 marks the 100th anniversary of the USA joining the First World War and while they are better known for their World War Two airborne missions there are still some surprising airborne connections. As 2017 is also the 75th anniversary of the USAAF arriving in Norfolk during WW2 we will also be commemorating this throughout the year, and our first event will take place in this season of events as a taster of what is to come! USAAF75: 2nd Air Division Stories. 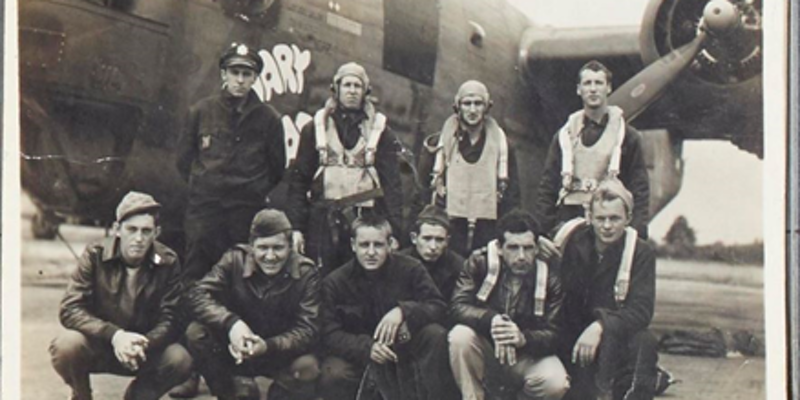 Nathaniel Sikand-Youngs and the Memorial Library’s American Scholars present stories of the American men and women of the 2nd Air Division, Eighth US Army Air Force, who were stationed in East Anglia during the Second World War. The stories bring together information discovered in the 2nd Air Division Digital Archive, a unique collection of over 30,000 images of original photographs, letters, memoirs and other documents. 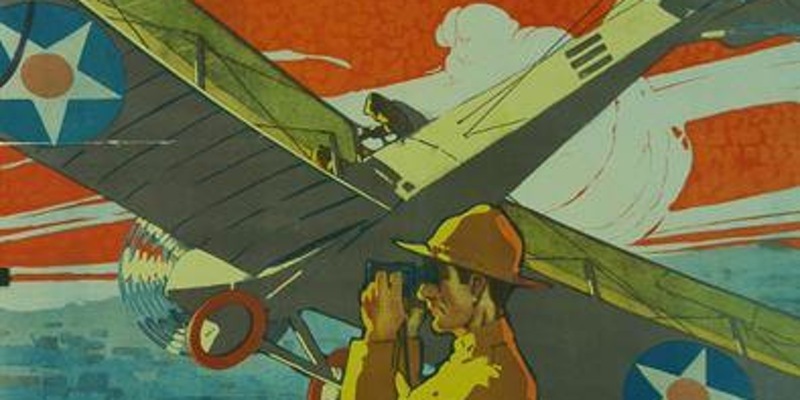 Local author and aviation historian Ian MacLachlan will be at the Millennium Library talking about the US Air Arm and the German Amerika programme 1917-18 (an effort by Germany to double aircraft output to support the push in March 1918 to beat the Allies before the American entry into the war made a difference). 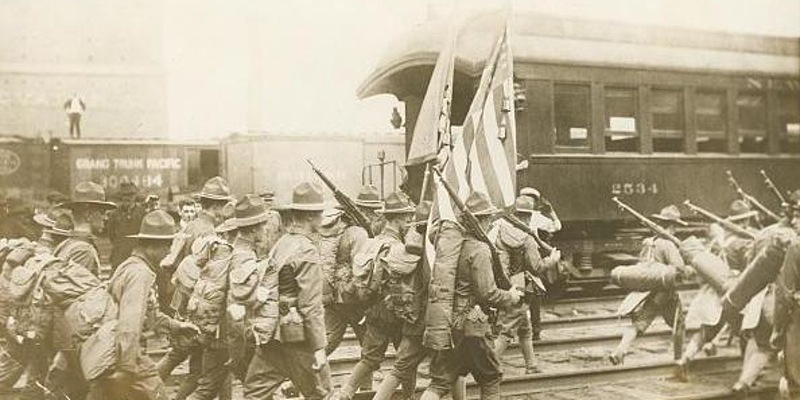 Dr Graham Cross (Cambridge and Manchester Metropolitan Universities) will be at the Millennium Library talking about America’s entry into World War One in April 1917. In his talk, Dr Graham Cross, explores the factors driving American intervention in the war, but also explores how we remember that pivotal decision. British narratives recognise the American contribution, but often also focus on the lateness of entry and the ‘Associate’ status of American belligerence in stark contrast to the later ‘Special Relationship’ between the two nations. The story of how British hopes and expectations, both at the time and since, colour our understanding of the American entry into World War I is both fascinating and timely in this centenary year for American participation in the war. 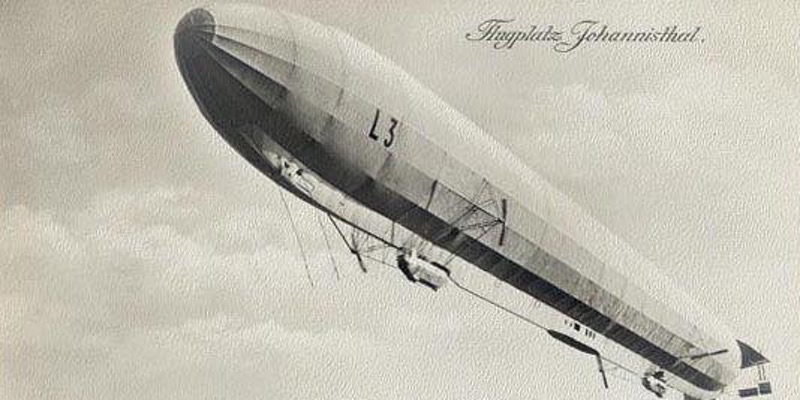 Local author and historian Steve Smith returns to the library, this time giving an illustrated talk about the World War One Zeppelin air raids on the county. Exciting news from Gresham’s School! Gresham’s School in Norfolk has recently been awarded £10,000 through the Heritage Lottery Fund’s (HLF) ‘First World War : Then & Now’ programme to create a dedicated website as part of its commemorations for the Centenary of the First World War. This award will enable the School to provide an interactive website devoted to the 110 pupils and three staff who lost their lives, with profiles and supporting documentary evidence, plus a database of information on the 500 from the School who served. They will also be able to carry out essential conservation work on important sources, such as the roll of honour and photograph albums, to make sure they are available for future generations. The School Archive is a fantastic resource for historians of all ages to study the conflict, including letters from the front and obituaries published in the Gresham Magazine, as well as photograph albums, a vellum roll of honour, home front accounts, and biographical material donated by family members. Thanks to a project developed with Charterhouse, Year 9 pupils are fortunate in being able to use the collection to enrich their WWI history lessons, and Gresham’s would like to extend this opportunity to pupils in other schools. The new website will provide digitally recorded materials which will give access to schoolchildren, historians, people researching their family histories, and the local community to study the conflict and its impact on the School. Pupils will be involved in researching information for the website and members of the public will be invited to contribute their own family photographs and documents to add to our knowledge. In conjunction with Holt Library, Norfolk Record Office and the Norfolk Regimental Museum, Gresham’s will be taking part in a family history day on 5th May. This will be a great opportunity for local people to use online and written records to find out about their WWI military ancestors with help from professionals. There will also be an opportunity to visit the School Archives and to see some of our WWI collection in the afternoon. 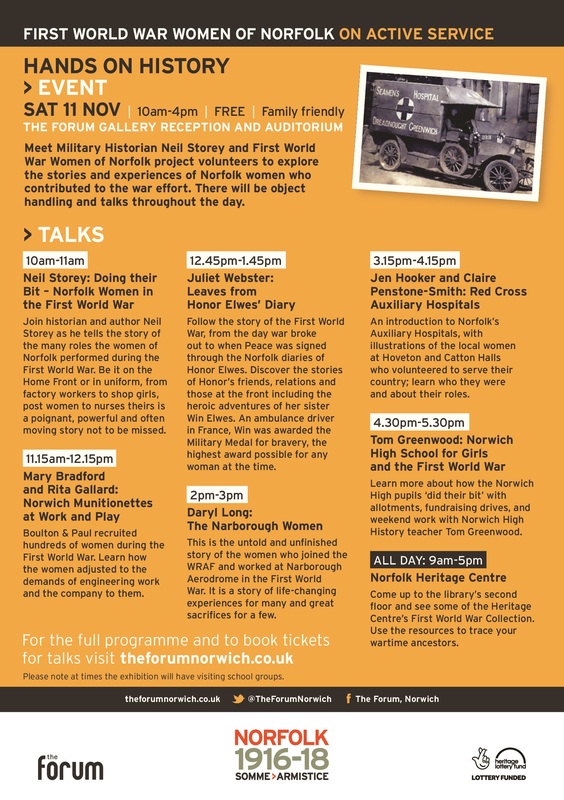 To commemorate 100 years since the out break of war the Millennium Library, Regimental Museum and Norfolk Record Office have teamed up with The Forum Trust, Gressenhall Museum, historian Neil Storey and many other partners to plan an incredible day of events at The Forum. Throughout the day The Fusion Screen will show the Norwich Roll of Honour, in memory of the 3,500 Norwich people who lost their lives in World War One. The names will be displayed on the screen throughout the day and into the evening, and the space will provide an opportunity to remember those lost, and for quiet reflection. The event will be officially started at 10am by the Town Crier and activities will continue through the day culminating in a free talk from historian Neil Storey at 6pm (details of this talk here).